A bordeaux Blend of Exceptional Quality. 100% from our estates in Calistoga. 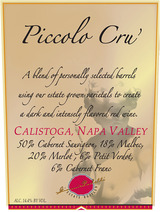 The Piccolo Cru is refined, complex and elegant. Well integrated with black cherry, warm spice, smokey oak and supple tannins. Pair with beef wellington, slow roasted lamb with caramelized red wine sauce, or roast duck with citrus pan sauce.